It was about four years ago at a Tom Douglas restaurant called Lola, located in the lobby of a Seattle hotel. We’d just checked in for the start of our babymoon. On the server’s recommendation my husband and I ordered the Smashed Garlic Fried Potatoes as an appetizer. Long story short, we came back to the restaurant the very next morning and ordered those darn things again for breakfast and I’ve been making my own version of them at home ever since. They were that good. I’ve figured out what it is about these simple potatoes that makes them so irresistible: it’s the smashed part. Once the little ball of a boiled potato gets pounded (gently) and its insides break out of the skin it creates all of these surfaces that stand to get crisped up with salt and olive oil in the second tour under the heat. It’s a lot like the English muffin nooks-and-crannies appeal. I just love it. I usually finish my smashed potatoes in the oven, but grilling them on the panini maker works just as well to get nice crispy tops. Especially on Thanksgiving when oven space often comes at a premium, this is great news! Inspired by the Smashed Garlic Fried Potatoes at Lola in Seattle and the Pioneer Woman’s Crash Hot Potatoes. Put the potatoes in a large pot and fill the pot with enough cold water to cover them. Add 2 teaspoons of the kosher salt. Bring the pot to a boil. Continuing boiling, uncovered, until the potatoes are fork-tender, 15 to 20 minutes more. Remove the pot from the heat and drain the water. While they’re still hot, carefully lay out the potatoes on a cutting board and give each one a good smash with a potato masher. The potatoes should remain in intact and flatten to a round disc, like a little potato hockey puck. 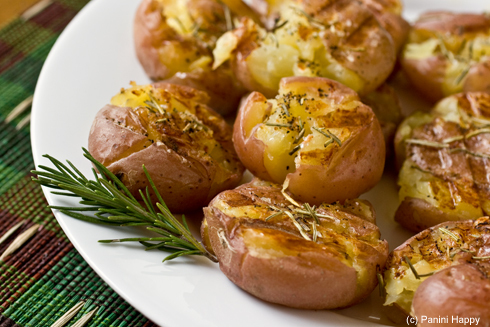 Drizzle olive oil over the top of each potato. Season with the remaining teaspoon of kosher salt, rosemary and black pepper. Add as many smashed potatoes as will fit on your grill (you may need to work in batches) and close the lid. Grill until the potatoes are crisp on top with golden grill marks, 4 to 6 minutes. This series is so much fun! I love the idea of grilling the potatoes. If you’re having a small group for Thanksgiving dinner, the panini press really can do it all. Mmm, love those crispy golden parts the best! These look so good! Thanks so much for the idea. You are brilliant, Kathy! I don’t know anyone else who could make an entire Thanksgiving feast on a panini maker. I can’t wait to see what else you come up with. How you think of these things, I have no idea. Yummmm! I can’t wait to try these out with my panini maker. This is certainly worth a try!!! Thanks for the recipe and I can’t wait to see what you come up with next for Thanksgiving on the Panini. I am LOVD´s last blog post ..Goodbye Week. Hello Weekend. Lessons Learned: Take 20. I love that you are doing this on the panini maker 🙂 These potatoes look crispy and delicious…yum! 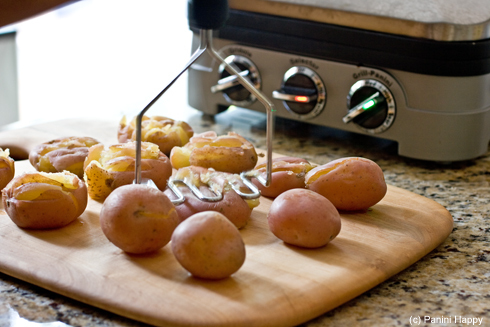 What a fun way to make potatoes!! So making this. Thanks for the inspiration! how many panini’s do you have? Let’s just say I’d need a whole fleet of trucks to serve my entire panini menu, lol. 🙂 Somewhere around 150! Can’t wait to try this, but I don’t have a panini maker. How do you finish them off in the oven?